Carlos first came to Hacienda Baru as an intern from the, Colegio Universitario de Cartago, this is a University that is known for its bachelor degree in tourism. While he was an intern Carlos did an exceptional job and helped out with tours, in the restaurant and in the office. His eagerness to learn and his proactive attitude were key to his success. When it was time to go home, we told him that if he improved his English he was welcome to come back for a permanent job. 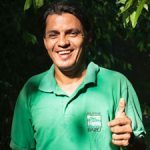 Two years later, Carlos gave us a call, he had worked on his English, he first worked in the office, but it was obvious that his real calling were the trails and canopy experiences in the Reserve. Carlos has now been leading tours on the Hacienda Baru National Wildlife Refuge for more than 10 years. You are likely to find him on the Flight of the Toucan Canopy Zip Line, telling stories to guests who are enjoying the Night in the Jungle camping tour or explaining a symbiotic relationship during the Rainforest Experience hike. Carlos is the 13th of 14 brothers and sisters; he is originally from the region of Los Santos located in the highest mountain range in Costa Rica. His passion is Environmental Education and Sustainability, and thoroughly enjoys teaching it to school groups that visit Hacienda Barú. His strength is the forest in general and rainforest ecology but he has a soft spot for sloths, we have both the two and three-toed at Hacienda Baru and Carlos loves them both. He is absolutely amazing at spotting them. When he’s not teaching school children about the environment, climbing into the rainforest canopy, or pointing out sleeping sloths to visitors, Carlos likes to spend time with young son.